That wafer-thin flat-screen TV you bought may be a treat for the eyes, but your ears are another story. The speakers built into skinny TVs are, by definition, small and thin, which limits their ability to move air. And since moving air is what sound is all about, you end up with flat, compressed audio. What to do? You could buy a full surround-sound system, with speakers up front and behind, but that often means running wires from the front of the room to the back, and certainly means more boxes and clutter. Or you could go with an increasingly popular alternative, the soundbar. A soundbar does away with multiple speaker boxes, along with unsightly cables and wires. It combines three or more speakers (for the left, right and center audio channels) in a single compact enclosure, which sits unobtrusively below the TV screen on a table, or hangs on a wall. And thanks to its unified design, a soundbar is a snap to set up. The majority of today’s soundbars are bundled with a separate subwoofer, a large speaker specifically designed to recreate the bass frequencies crucial for enjoying movie explosions and crashes. Sometimes the subwoofer connects to the soundbar via a cable, sometimes it receives the audio signal wirelessly. 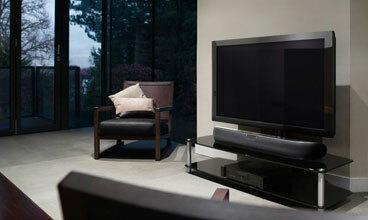 Where a soundbar differs significantly from a full surround-sound system is the lack of rear speakers. Instead, soundbar systems use sophisticated digital audio processing to simulate surround-sound, artificially replicating the sound you’d hear from actual rear speakers by using audio delay and bouncing sound off the side walls of the room. Of course, the size and shape of your room will determine how effectively this digital trickery functions. Even if you don’t get much surround effect, though, the soundbar system will still provide the volume, clarity and bass power sorely lacking in built-in TV speakers. All the soundbars we’ve auditioned here are of the active variety — that is, they are powered by built-in amplifiers and require no complex hookup to a receiver. They can be connected directly to a game console or Blu-ray player, but generally take the sound feed from the audio outputs of your television, or from the cable/satellite box. Polk Audio has been involved in soundbar innovations from the get-go, and now offers a family of what it calls “SurroundBars.” Some SurroundBar systems require power from a separate receiver or amp, but the SDA (for Stereo Dimensional Array) Polk SDA Surroundbar IHT 3000 ($250 on Amazon.com) is a self-contained unit. Bundled with a hefty wireless subwoofer, this unit uses RCA cable inputs, which means you’ll need to run over to RadioShack and buy an adapter if you want to plug in a mini-stereo cable, and can’t make a direct HDMI connection. The system's main bar uses two drivers powered by a 50-watt stereo amplifier, within an enclosure measuring 3.75 inches high by 31 inches wide and a slender 2 inches deep. Sound is robust, if a bit laid back. The Sony HTCT550W ($341.07 on Amazon.com) new entry has more bells and whistles than most in this price range. Along with a thin 37-inch bar that fits neatly under nearly any screen, the Sony is bundled with a control box with three HDMI inputs that adds unusual flexibility when it comes to handling multiple sound sources. There’s a remote, a wireless subwoofer and a robust 400-watt power supply. Simulated surround-sound processing is handled via S-Force PRO Front Surround 3D technology, and there’s also a built-in FM radio tuner. The TVee Model 30 ($600 on Amazon.com) has excellent balanced sound, whether you feed it the Rolling Stones, Rachmaninoff or “Ratatouille.” Boston Acoustics uses what it calls Digitally Optimized Virtual Surround processing for its surround system, which includes a separate “music” mode (along with a “movie” mode) that really does improve musical reproduction. Recently, the company joined with Bassett Furniture to create a line of “Nvelop” wood credenzas with built-in BA soundbars. The units, priced from $1,500 to $2,000, also feature a six-inch subwoofer hidden inside the cabinet and a built-in mini-stereo jack in a drawer for iPods, MP3 players and computer audio connections. 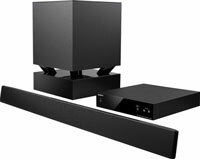 You’d think for $2,200 (on BestBuy.com), Bowers & Wilkins would include a super-size subwoofer with its Panorama soundbar. In fact, there’s is no sub at all… and it turns out, that’s the last thing the Panorama system needs. The soundbar alone fills a room with deep, rich audio, and is especially adept as using the room’s acoustic properties to create impressive surround effects. Five speakers are contained in the soundbar, which offers a selection of surround mode settings to suit your listening mood. I read your article on the soundbars. I would like to obtain one, but I have a question. My HD TV has 16 speakers built in and we have a separate sub-woofer. Can I purchase a soundbar without the sub-woofer and hook it up to my sub-woofer? Yes, you can purchase a soundbar without a subwoofer. For instance Polk makes one, the Surroundbar 50 (http://www.polkaudio.com/homeaudio/surroundbar/index.php?s=50-inch#50-inch). Just make sure your subwoofer takes a standard subwoofer input. Have you evaluated the quality and versatility of ZVOX products? I’ve heard that the ZBASE 580 beats out both Sony and Polk in sound, ease of instalation, and quality. I’m a tech idiot who doesn’t even have a smart phone or use an iPod (although I just got one as a present), so the more input the better before I invest money that I don’t have. I have a panasonic home theater system, but it doesn’t sync well with the flat screen and blue ray I just got, and I’d like to get rid of the wires to all of the speakers, and limit the amount of remotes on my table. All the soundbars have a built-in amplifier. Before you buy, however, make sure that the audio outputs on your cable box match what’s available with the soundbar. For the Vizio SB3820x-c6, the only digital input is an optical (Toslink) jack (there is no HDMI input), so make sure your cable box has an optical output.